Whilst there are many press reports that state that the number of vehicles being stolen is decreasing in many markets, cases of component theft appear to be increasing. This shows that improved security may make it more difficult for entire vehicles to be stolen, but criminals will adapt to find new ways of making profit from theft. NAPCO Security Technologies, Inc., one of the world's leading suppliers of high performance electronic security equipment for over 30 years, announces its Networx Wireless Locking System is being installed nationally, with many organizations placing repeat orders or standardizing with the product line for future jobs, according to dealer feedback the company has received. Last week we mentioned two companies in this industry who were among the very few who were doing marketing promotion around Euro 2012. We're delighted to report that the Euro Access ad (see below) had an incredible 674 downloads of its promotional leaflet the same day that LASN was broadcast! That's an amazing result from a single appearance of an ad and we're delighted that the investment in taking the time to do something like this is paying off so handsomely for the company. We're not expecting everyone to now rush off and place an ad with us (although that would be nice) but it underscores the fact that good marketing ideas do work. And if you can't think of anything original, what about adapting an idea that's been used elsewhere? 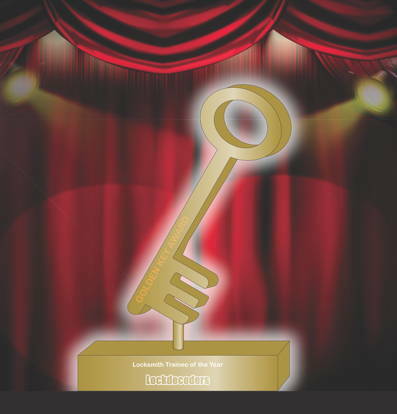 The big news this week is the launch of the Golden Key Award sponsored by Lockdecoders. More details below. Fatalities involving securty guards have made international headlines this week. Closer to home, we hear that security guards will begin to patrol city streets. We're not sure that private police forces are a good idea, but if the real police are too busy ticking boxes to come out themselves, then they only have themselves to blame. Do you have a trainee or apprentice working and learning with you who is truly exceptional? 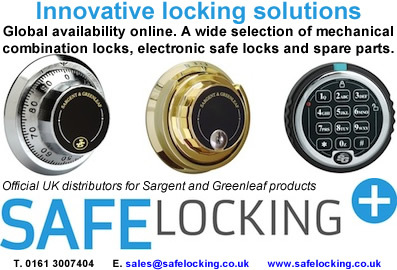 Or have they perhaps had to rise to overcome a physical or social disability or other life disadvantage in order to get to a position where they are now learning their locksmithing skills from you or your company? If so, the Golden Key Award is for them! And for you. Extra CCTV should be considered at all Norfolk museums after Lord Nelson artefacts were stolen, a report shows. Items valued at more than £36,000, including a ring, saucer and medals, were taken from Norwich Castle Museum on 25 February. However, the review states security is sufficient to exhibit items from national museums. Milestone Systems, the open platform company in IP video management software (VMS), maintains its position as the number one vendor for total VMS global market share in the latest report from IMS Research. IMS Research, recently acquired by IHS Inc. has just published the ninth edition of its report: World Market for CCTV and Video Surveillance Equipment. The results are based on data from 2011. It contains comprehensive information on all suppliers providing analog and digital video surveillance components such as cameras, recording solutions, video encoders and more. The Standards Development team at Skills for Security is calling on industry practitioners to lend their knowledge and experience to develop a new suite of National Occupational Standards for Event Security. An Advisory Working Group is being formed to start work in mid-June. Dozens of SmartWater marked graveyard memorial plaques, along with other metal ornaments and a large quantity of cash, have been seized during a police-led Day of Action at a South London scrap yard.